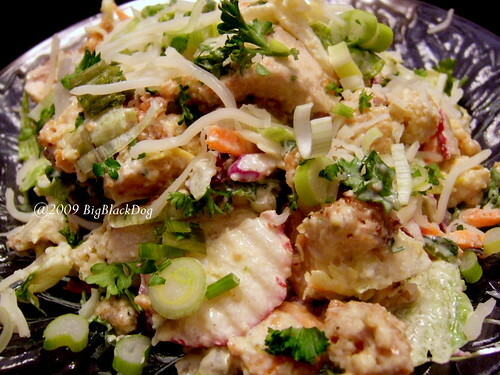 I am not much of a salad person but there are a few salads that I thoroughly enjoy and one is a good Caesar Salad. I know Tyler calls his salad Creamy Parmesan but it's really a darn good Caesar! And you will most definitely have some wicked breath after enjoying it. Just spread the goodness around and make sure that everyone at the table gets their fair share! I made my own version of Chicken Paillard dredged in flour and Pecan meal and the recipe is below. 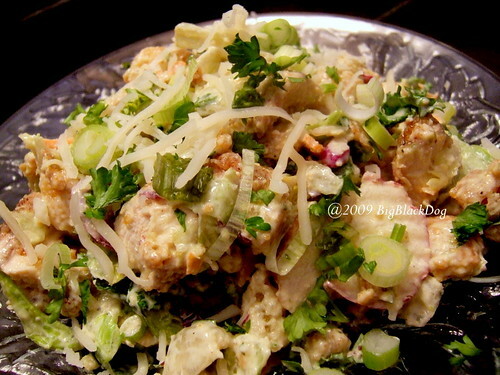 When the chicken had cooled, I cut it into bite-sized pieces and then mixed the chicken into the salad. And for the salad I used a bag of Spring Ready Mixed Salad Greens and added some chopped Green Onions and fresh minced Parsley. For the dressing I added some fresh minced Basil and Tarragon and substituted Anchovy Paste for the whole Anchovy Fillets. And I only used the juice of 1 lemon which yielded over 1/4 c. of fresh lemon juice which was plenty. Mix pecan meal, salt and pepper and flour. Dredge chicken breasts in pecan/flour mix until breast is completely coated. Heat butter in heavy bottomed pan. When butter has melted, add EVOO and wait a minute until oil is thoroughly heated. Add chicken breast and saute over medium heat, turning once. Chicken breasts are done when juices run clear. Begin by pounding out the chicken breast gently between 2 pieces of plastic wrap. Prepare a breading station with flour, whisked eggs and milk, and panko crumbs. Season all with salt and pepper. Coat the breasts in flour, egg then panko. Lay the coated breasts out on a flat tray and refrigerate to let the crust dry out (about 10 minutes) this will ensure there is less moisture and less chance your coating will break when frying. Shallow fry the paillard in hot oil for approximately 2 to 3 minutes per side depending on how thick the breasts are. Drain well, season with salt and set aside when done. Prepare the salad by splitting the grape tomatoes in half through the middle lengthwise, mixing all ingredients in a large mixing bowl. Add the dressing and toss the salad well. To serve lay the warm, crispy chicken paillard on the base of the plate and top with the salad. Garnish with shaved Parmesan cheese, a wedge of lemon and a drizzle of olive oil. Due to the slight risk of Salmonella or other food-borne illness. To reduce this risk, we recommend you use only fresh, properly-refrigerated, clean, grade A or AA eggs with intact shells, and avoid contact between the yolks or whites and the shell. Please visit Tyler Florence Fridays and see what the rest of Tyler's groupies are up too this week. While making the salad I did enjoy a glass of my new favorite Red Wine, De Bortoli Petite Sirah. It is so good and only $5.99 a bottle. Do you believe that price! I'm getting more on Saturday. It's not a wine I'd get for a special dinner party but for our family dinners, Sunday through Thursday, it's just great! I wish I could eat it right off the computer screen right now. I love every part of it, invite me over next time! Love that type of salad. And that's a great deal for the wine!Glad you didn't omit the anchovies! If Natashya is coming, and you are serving this, please let me come, too! This is just absolutely the best looking thing I have seen all week...so right up my alley of tastes. Drooling over here, and it isn't even lunch. Ha ha , when I made that chicken I didn't try the dressing - but now I have to because my kids love a good caesar! Thanks for the warning, though. I'll have to serve mint ice cream for dessert! That looks delicious and very tasty indeed! Yup, I am clipping this recipe too. It is definitely something that we would love. Thanks for the suggestion of chilling the breaded chicken. I have had trouble with the Panko slipping off. I love your choice of wine at a reasonable thrifty price. Yum! I have been craving a good Caesar-style salad lately. This looks delicious--love the pecan meal crust too! Ooo, this salad does sound amazing! I love Caesar; I don't care if it gives me bad breath--it's way too good to ever pass up. I've never really made my own before, so I'll have to give this a try. It certainly looks delicious! Only a Philistine would say that garlic breath is bad; I'm with you on loving a good Caesar salad, garlic breath be damned. Looks like a great dinner. I love salads like that for dinner! that, however, would not keep me away from this deliciousness! lol at the big warning, everything looks and sounds amazing. $5.99 for wine you like to drink - sweet! i wonder if i can find that brand. Sounds and looks great. Salad and wine sounds like just what I need! Screw the bad breath and give me seconds. Yum! That looks so delicious! I love that wine too! It's such a good value! I drink the DB chardonnay all the time. Consumate dreamer, artist, baker and friend who enjoys finding beauty in things that others overlook. A Triple Header with a Grand Slam Bread!